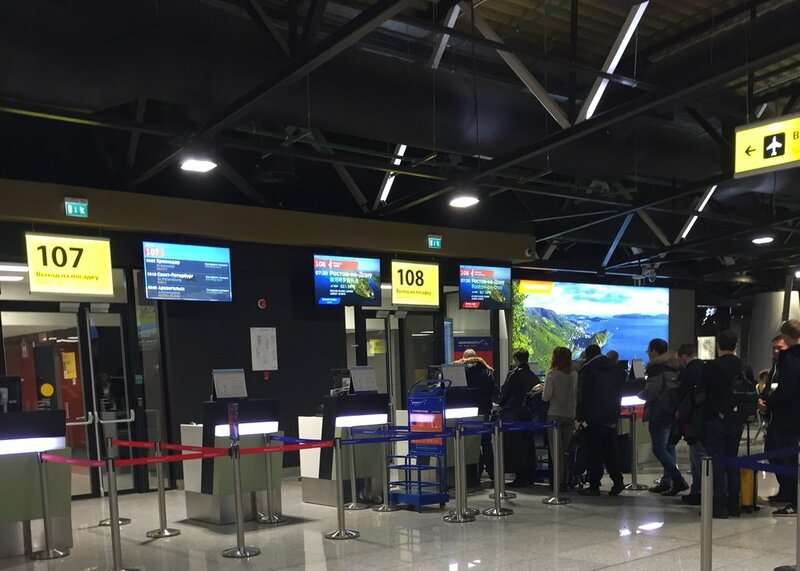 Just in time for the World Cup inauguration, Moscow’s Sheremetyevo airport inaugurated its new B Terminal. In fact, it would be more appropriate to talk about a “re-opening” since B terminal had existed for decades at that same spot, just in a completely different shape. So different that we could say it has been pretty much rebuilt from scratch (which has meant also the demise of its iconic round building!). I had flown once from terminal B before the reconstruction and the difference could not be starker. The new terminal B is a shiny, spacious building physically separated from the main block of terminals (D, E, F) by the main runway. A subterranean people mover connects both parts of the airport. At the moment it used mainly by Aeroflot and, since its opening last summer it has been progressively concentrating most of the Russian airline’s domestic flights. The high ceilings and spacious halls, a tag of today’s airport design best practices, are a welcome addition to SVO and they contrast with the increasingly cramped corridors of the older part of Sheremetyevo. Although it is a bit further from the city center than the old terminals, SVO’s B Terminal is, by a wide margin, the best of Sheremetyevo’s terminals from a passenger experience point of view. The only two negative spots where at its access points, first the last stretch of road before reaching the terminal leaves much to be desired, I arrived by taxi and it took us half as much time to complete the last mile before the terminal as it took us to reach the airport from central Moscow, this was due to a rather chaotic traffic management at the airport approaches, which seemed to be still unfinished (this may improve eventually). Inside it’s all new and shiny. Inevitably, prices are also in line and considerably expensive, even by Moscow standards. One small detail that I find important to remark here, although it is not exclusive of SVO’s Terminal B: mobile boarding passes are usually not accepted at Russian airports, so, if you show up at security control showing the barcode on your smartphone screen you are going to be sent back to the airline counters area, where there are machines that print a paper boarding pass for you (it is usually no big deal, but can be quite frustrating if you are short of time and there are queues). A detail I liked is that the waiting areas by the gates are decorated with large electronic images of different destinations in Russia, very convenient for a terminal that handles mostly domestic travel and very inspirational for when planning new trips to explore this huge country. The monitors announcing the flight departures by the gates also show, in the background, images of the destination people are boarding for. Simple, but a nice way to make more attractive something so mundane as a departure gate monitor. And there we go…ready to board! Notice how the design for the new terminal combines some warm colour elements with the black, white and grey tones that dominate throughout. The resulting combination is quite neat and minimalist, but at the same time gives personality to the building.